On September 28, 1855, Henry Kirke White Muse (c.1838-1858) left his “parental root,” a family plantation in Louisiana, to “launch” himself “into the cold world” as a freshman at Princeton. After two weeks of travel, he reached New Jersey—and found a letter from his father already waiting. 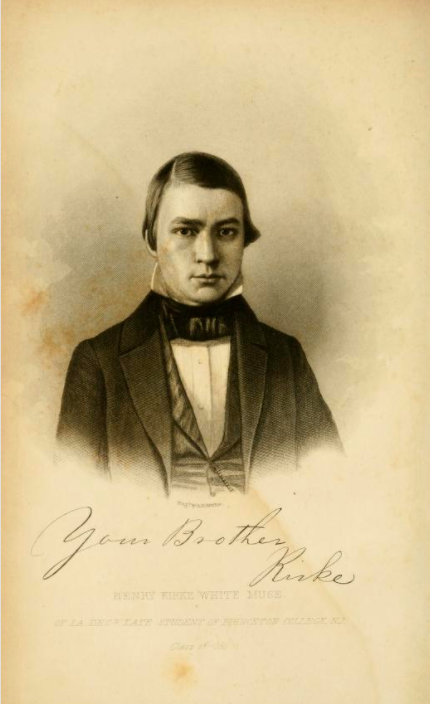 This “first weekly messenger of parental love” inaugurated a series of letters the young man known as Kirke received from his father James Holcomb Muse during his time at Princeton. Determined to maintain regular contact and contribute to the “formation” of Kirke’s “character” despite their separation, James used his letters to examine copious aspects of Kirke’s new life—from advocating proper poses for studying to a warning to “by all means, avoid excessive chess-playing.” With his son embarking on a lengthy stay in the North, James’s fatherly advice formed part of a targeted educational agenda. Although Princeton had a large proportion of southern students, a fact that appealed to and reassured many slaveholding parents, James still wrote regularly to keep Kirke mindful of his ties to the South. At Princeton, Kirke took lessons in Latin and mathematics; from his father’s letters, he learned about family expectations and his complex ethical and fiscal obligations as a slave-owner. Yet the tensions inherent in the pursuit of a principled life and the ownership of slaves remained unquestioned, and unresolved, in James and Kirke’s correspondence. Henry Kirke White Muse, an antebellum Princeton student from a wealthy slave-owning family. Certificate detailing the land purchased by James H. Muse in Louisiana in 1861. Princeton is such a dull place that it would require the pen of Washington Irving himself to make any thing connected with it interesting. Let the Southerns come here. I believe that old Princeton College is THE College, not the college of the South, nor of the North, but the college of the Union. Politics is the engrossing topic here now, and we have every class: Southern Fire-eaters, ultra-Democrats, Black Republicans. Abolitionists, old line Whigs, etc. The Black Republicans and Abolitionists, however, are very few, and have sense enough to keep their principles to themselves. He further informed James, “I am now a Whig, and hope to be one all my life, whether they are strong or weak”—information that aroused no paternal response. Regarding the relation of master and slave, in our country, as a permanent one, and as involving great moral and religious responsibility, and expecting…to bestow upon you…some estate in slave property, I feel, and my reflections have greatly increased my solicitude upon this subject, a great desire to see you regulate your life by correct principles, in this important relation. “That your slaves…should be clothed, housed, and provisioned…is, most manifestly, your interest, as…one of the most certain means of securing your capital inherited in a slave estate,” he wrote. Nor should slaves be overworked. While “a certain amount of physical labor” “is absolutely conducive” to “good health, a sound body, and the enjoyment of life,” James warned that “over-working your slaves would be calculated to defeat” the “productive value” of both slaves and estate. Indeed, James declared, “that system of management which tends most to develop the man, instead of the mere rational animal, in the slave, will, with rare exceptions, increase his intrinsic value as a slave.” James’s letter reveals little awareness of any moral tensions in his worldview. Without a hint of irony, the planter articulated a strategy that acknowledged enslaved people’s humanity—but only as a means of increasing their monetary value as property. J. H. Muse, Correspondence with My Son, Henry Kirk White Muse. Embracing some brief memorials of his character, and essays from his pen, while a student at Princeton College, New-Jersey (New York: John A. Gray, 1858), 287-288. Upon Kirke’s early death in 1858, James published their correspondence and dedicated it to the Princeton class of 1859, with which his son would have graduated had he lived. James married Martha Ann Keller on 20 March 1844 in East Feliciana, soon after Julia’s death, but Keller also died young (at age 27) on 23 October 1852. Louisiana Marriages to 1850, accessed 17 August 2017, www.ancestry.com; “Martha Ann Keller Muse,” Find A Grave, accessed 17 August 2017, www.findagrave.com. 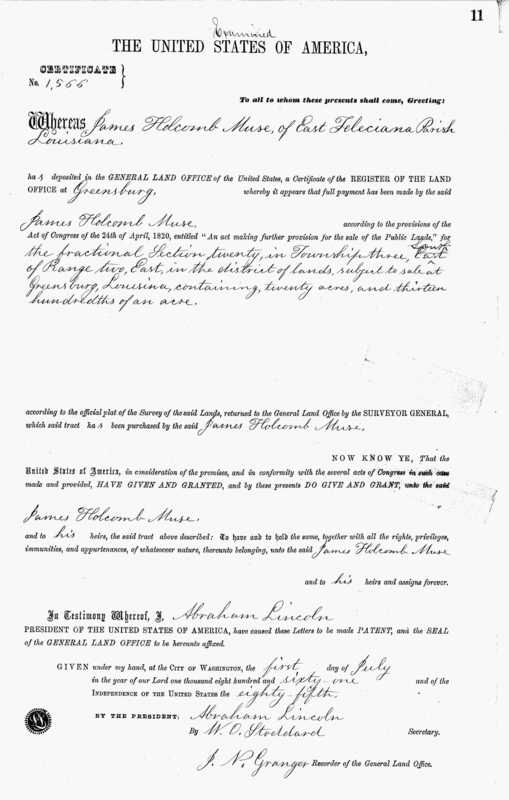 Information on James’s property holdings from 1850 Federal Census and 1850 U.S. Federal Census - Slave Schedules, accessed 17 August 2017, www.ancestry.com. The census also notes his occupation as lawyer. Information on East Feliciana from Richard Holcombe Kilbourne, Debt, Investment, Slaves: Credit Relations in East Feliciana Parish, Louisiana 1825-1885 (Tuscaloosa and London: The University of Alabama Press, 1995), 15. Muse, Correspondence with My Son, 36. James was candid with his son about fiscal ebbs and flows, and in 1855 and 1856 doubly suffered from legal defeats and a poor crop. Ibid., 194. This was Kirke’s first letter to his sister “Oc,” dated 28 February 1857. Ibid., 241, 68, 220, 232. Kirke continues, “Since the Northern wing of Know-Nothings have fused with the Black Republicans, who will almost certainly nominate Colonel Fremont, it is thought by many they will be successful. I read the New-York Tribune occasionally, and will send you a copy of it and the Herald soon.” Ibid., 134. He continues, “The Know-Nothings here have given me a bad opinion of that party.” The Whigs eventually endorsed the Know-Nothing ticket at their final party convention in September 1856. Ibid., 137. Ibid., 198. James soon after instructed Kirke to “copy my letters on slavery, and send me the copies revised and corrected. I want to see what they are.” Ibid., 212. Ibid., 14. Kirke’s obituary recorded these as among his last words before his death on 23 February 1858.